We have been serving Newport-Mesa families since 2002. If you think your child might benefit from tutoring, either to reach grade level, maintain a certain GPA or for enrichment, please give us a call to set up an assessment or initial meeting. Tutoring Club of Costa Mesa will help your child on their way to success regardless of their skill level. Whether your student needs help with the fundamentals, math, reading, writing, or even SAT & ACT Prep, our tutors will get them pointed in the right direction with all the guidance they need. Our individualized approach targets your student's weak points and improves them, bringing their ability up to the set goals. By covering key points at the student's own pace, we allow them to flourish and learn at a stimulating and rewarding rate. Did you know that over our summer vacation we can lose up to 80% of what we learned during the school year? Imagine training an athlete for nine months, getting them to a prescribed level of conditioning... then telling them to take three months off and do nothing! Now, imagine getting them back on the field of competition at the end of those three months and expecting them to perform at their training peak. While every good coach will build varying levels of intensity into their training programs, none would ever recommend extended periods in which not even minimal skills are practiced. Ironically, this is the very thing that parents and schools routinely do over summer vacation. This can have profound consequences on the ability of children to remain at or above grade level in critical academic areas. Parents can do a lot for their children during the summer to keep their interest in learning alive, but it is easy to underestimate the academic progress that can be made with even a few hours of tutoring each week during these summer months. 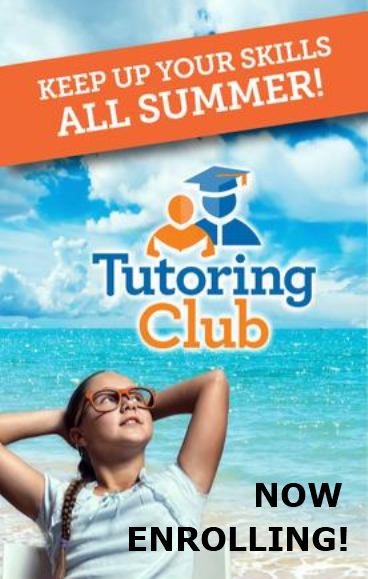 The Tutoring Club provides the setting and expertise to develop and retain reading, writing, and math skills over the summer. Summer tutoring sessions can help a child return to school in the fall with increased confidence, and a greater likelihood of quickly picking up and even moving past the academic level they were at when summer began. In Costa Mesa, it can sometimes be difficult to find a good tutor that can help a student with their homework and prepare for tests in a constructive manner. At the Tutoring Club of Costa Mesa, we pride ourselves on choosing and thoroughly vetting only the best tutors. These tutors are experienced and knowledgeable in their skill areas and can provide vital assistance to your student whether they are struggling with particular homework problems, needing a refresher before a test, or just wants to get more practice in before a final. If you have a student that is getting ready for college, we are no strangers to preparing soon-to-be freshmen with the knowledge that they need to succeed in the busy and challenging life of college with our College Prep Program. Costa Mesa Tutoring Club has skilled tutors, many of which have degrees or other experience in their areas.